The Society's Courtney Shallcross is an exemplary model of what Inoubliable Model Army looks for in new up & coming talent. Hailing from Pittburgh, Pennslyvania, twenty-one year old Shallcross possesses a striking and beguiling look that is matched in equal measure by a dynamite personality and that all important 'it' factor. Shallcross' felinesque features, menacing gaze, and magnificent 180 cm frame, cut an imposing path through the Fall/Winter 2013 season with whiplash inducing appearances at Antonio Berardi, Kinder Aggugini, Reem Acra, Emporio Armani, Tibi, and Sachin+ Babi amongst others. Modelling for less than a year, Shallcross has displayed stunning versatility and emotional range in test shoots with photographers Ben & Zie, and Joseph Chen. With a professional pilot's license as part of her secret arsenal together with a positive attitude and outlook on life, Shallcross is certain to continue on her path towards joining the ranks of modelling's elite. Shallcross caught up recently with Inoubliable Model Army to share her musings on the month of fashion madness, her love of flying, and her summer holiday plans for setting up digs on Lake Fire. 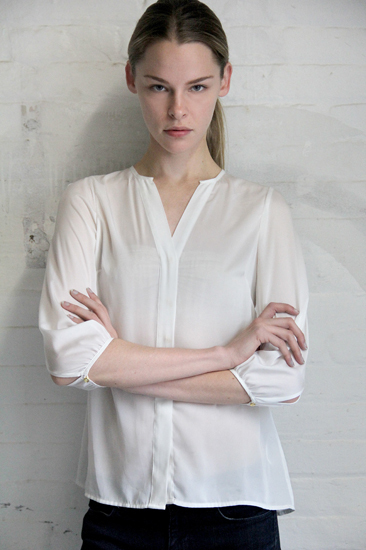 Inoubliable Model Army: Hi Courtney, congratulations on a fantabulous Fall/Winter 2013 season! Your show list included turns at Tibi, Sachin + Babi, Antonio Berardi, Kinder Aggugini, Comme des Garçcons, Emporio Armani, and Tsumori Chisato. How are you feeling in the aftermath of the shows and what were your personal highlights of the season? CS: I'm very pleased with this season! I was so happy to do those great shows, and I found this season to be easier than my first back in September last year. It helps to know what to expect going into the month and being familiar with the whole process and the people. 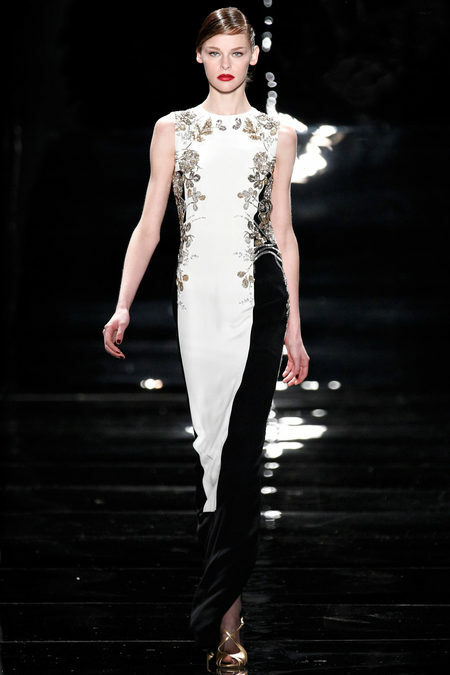 It's hard to pick a favourite experience, but I really loved doing the Reem Acra show. My first look made me feel like a villain and the second look was a gorgeous, sleek dress. It's playing dress up on a whole new level! Also, with me being a big foodie, my other favourite thing about the shows is experiencing all the different foods in these countries. I can't resist! Inoubliable Model Army: What are your survival tips for getting through the month long fashion frenzy? CS: I tried to get as much sleep as possible and took vitamins to avoid getting sick. Mentally, I tried to take things in stride and not put too much pressure on myself. My attitude was "whatever happens, happens". The whole experience has been unbelievable. Inoubliable Model Army: You're relatively new to modelling having debuted at the Spring/Summer 2013 shows with appearances at Theyskens Theory, Marc Jacobs, and Louis Vuitton to name but a few. Did you feel more confident going into your second show season and what was your approach heading into castings? CS: Last season was definitely a confidence booster! I did not expect to get some of those huge shows! It's nice to go into castings and have some of the casting directors and designers know me. I felt less intimidated and nervous! Inoubliable Model Army: Would you mind sharing a bit of your back story with us? CS: I'm 21 years old and from Pittsburgh, Pennsylvania. Two Christmases ago, my family and I were going to Houston to visit family. My brothers and I were coming from Pittsburgh to Charlotte, and we missed our flight from Charlotte to Houston by five minutes, so we had to wait for another two hours. That's when my mother agent approached me and it all went pretty fast from there! People had talked to me about modelling before but Pittsburgh isn't exactly great for high fashion modelling, so I never had the desire. Inoubliable Model Army: You apparently have a keen interest in aviation, having recently acquired a professional pilot's license. What do you like most about flying and has this put you in good stead to handle the amount of travelling that modelling entails? CS: Yes, I am a recent private pilot! I am halfway through school air traffic control school and getting your license is a requirement for the program. At first, I was so nervous about the thought of flying but there's no greater feeling than the adrenaline rush of taking off or having a smooth landing! It's the best sense of accomplishment. I always have my license on me to whip out just in case (mostly for bragging rights, haha). I guess my love for airplanes will come in handy with all the travelling that comes with modelling! Inoubliable Model Army: You're part of a new wave of American models including Athena Wilson, Juliana Schurig, Louise Parker, Dana Taylor, and Jasmine Tookes who are redefining concepts of American beauty. Did you consider yourself beautiful growing up? CS: Growing up, I have to admit I did consider myself pretty! We all have our awkward stages, but I was always proud and confident about my height and embraced it. It never stopped me from wearing heels, and I felt that it actually made me unique, being one of the tallest in school. I played volleyball for six years as well, so the height definitely came in handy. Also, my family did a good job of enforcing the fact that being tall for a girl was a positive thing. Inoubliable Model Army: In the short amount of time you have been modelling, what are the most valuable life lessons that you have gained? CS: I've learned that as a model, you really have to go with the flow and not be too hard on yourself if jobs fall through or you don't get the show you were hoping for. You can't take things personally, or you will drive yourself crazy! It's important that you understand that there are always new opportunities around the corner. I'll admit that patience is not one of my strong points, but I just tell myself that when one door closes, another one opens. It's also important not compare yourself to other models. Everyone is different with their own look, so just focus on improving and learning to make yourself better. Inoubliable Model Army: What do you love most about modelling? CS: My favourite part about modelling is the travelling and the opportunity to meet such important and influential people in the business. I never thought I would ever get the chance to work with such amazing designers that I have only read about in magazines and seen in the media throughout my life. Inoubliable Model Army: What do you feel are the biggest challenges that you face personally as a model? CS: I would say the hardest part is being away from my family and friends. I feel like I can't complain, because I'm only an hour flight away when I'm in New York, but when I'm in amazing places like London, Milan, and Paris, I can't help but think how much I want them there to experience it with me. Inoubliable Model Army: New York is quite a change of pace from Pittsburgh, Pennsylvania! CS: I was born and raised about 45 minutes from Pittsburgh in a very quaint and small town. Everyone knows everyone there, which is something I like... so moving was and still is an adjustment for me! I'm really liking the city though, because there's always something to do, and it's reassuring for me to know that I'm in the right place to make something out of my career. Inoubliable Model Army: Inoubliable Model Army stopped dead in it's tracks when we first saw your Production at Art + Commerce polaroids. You possess an aspirational beauty that casting directors and the public adore. With the industry the industry being saturated with so many beautiful girls, what do you feel are the most important factors which contribute to a model's chances of success? CS: It's important to have confidence, maturity, and a good attitude. Having a thick skin comes in handy too. This industry is full of rejection and a lot of the time hearing no more than yes. It's important to be hopeful and optimistic and to not let things discourage you. Inoubliable Model Army: You have been featured on a number of style blogs, How would you describe your street style, and which three designers are you currently mad about? CS: I like to wear basic and simple pieces that accentuate my body shape like wearing skinny jeans, or shorts with stocking to show off my legs. As boring as it can be, I wear a lot of black, white and neutral colours! I feel like I'm always reaching for the black pieces when I shop. If my closet could consist of Alexander Wang, Carven, Helmut Lang, and Theysken's Theory, just to name a few, I would be content! Inoubliable Model Army: What do you hope to achieve in the course of your modelling career? CS: I'm excited about the fact that I will continue to meet amazing people and travel to more places. That seems to be the most rewarding part for me. I'm still in shock about the experiences I've had so far and I've only been modelling for only a year. It's so exciting. But if I'm dreaming big, I would love to own my own summer home on Lake Fire where my grandma already owns a cottage! Inoubliable Model Army: One of the most enjoyable aspect of show season are the friendships formed between the girls. Did you bond with any other newcomers and how important are those friendships for getting through modelling's ups & downs? CS: It has been great bonding with other girls and comparing the good and bad stories we've all had! It's nice to talk with people who do the same thing you do and who understand the business. I enjoyed this past fashion season because I have formed closer friendships with some of the girls. CS: I've been told that I have a distinct and unique look. Sometimes I hear that I have a classic American beauty, and then I'm told that I look like a cat or an alien "in a good way", haha! So hopefully that means I have a versatile look. But honestly, nothing makes me happier that when I go to castings and people remember me as the air traffic controlling pilot model!